Gossip Girl has always been unrealistic but entertaining, however, there's a thin line between that successful formula and shenanigans that seem straightforwardly ridiculous. Personally, when the plot wasn't downright obvious - identical manila folders, come on - it felt like a bit of a bore to me, lacking the humor, sordidness and scandals we love. To be fair, it's nice they didn't simply gloss over the issues lingering over the winter break. Everybody is battling hard and still struggling mightily for what they want. "The Kids Are Not All Right" certainly lived up to its title. Important, non-white Gossip Girl characters?! Awesome! The relationship of Dair, flirtations between Chuck and Raina, reconnection of Serena and the just-freed Ben, revelation of the history between Lily and Russell Thorpe (Raina’s father), and mysterious buyer(s) of Bass Industries are all intriguing. The problem is that relatively little was revealed on each front, while the action unfolding felt forced and dull at times. I'll give Gossip Girl a pass in that stories do take time to develop and I'm excited about these, but I wasn't a huge fan last night. Maybe it's just that the episode revolved heavily around Lily. Everyone's mad at her and for good reason. Stunningly, Serena couldn’t find the judge to get Ben's conviction thrown out after her mother let him rot in the slammer. Chuck, who seemed more like a Chuck caricature with those chicks in the limo, couldn't find Jack but thinks his father’s old friend can help thwart Bart's conniving widow. Nate is babysitting his paroled pop. Dan and Blair don't know what to make of Dan and Blair either. The first Humphrey-VDW family brunch of the year is hella awkward. Rufus and Lily try to smooth things over with Serena, Dan and Eric, but it's not happening. Then Lily calls the judge and tells him he can come back from hiding (!?). 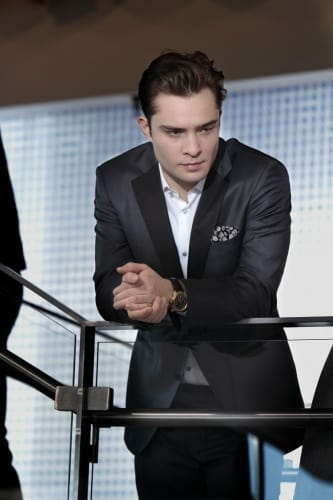 Chuck discovers the Bass Industries sale will be done in 24 hours and plans a major take-down of Lily at the big party thrown by Bart's old associate Russell Thorpe. Lily admits to Chuck that the company is effed, and she HAD to broker a deal with this private bidder where she can control the sale, rather than letting it go under. She promises Serena will see the light, too. Chuck sort of buys it. Meanwhile, Serena blows off Dan for the 378th time, and he misses his internship interview. Nice. Chuck assumed - and Lily lied through omission - that Thorpe was the buyer. He's not, but wishes he were, so he could sell it off piece by piece. Dude hates Bart. Can Chuck win back control of the company? Just as Chuck and S prepare to slam L into backing off the sale, the manila folder switcheroo is revealed. Forged affidavits are blackmail worthy. Dan's resume, not so much. But, lo and behold, the buyer is scared off by this family drama (?!) and Thorpe steps in to buy Bass Industries after all - with none other than The Captain at the financial helm! That was an interesting twist, we'll admit. Nate's dad, who seemed content to sit around, play Wii and chase skirts all day, is shaping up to be one of the crew's adversaries. Meanwhile, Dan misses another interview because of Serena. Blair, scheming to become the right-hand woman of Indra Nooyi, is trying to con her own mom. It doesn't work. This story line seemed designed almost to give Ms. Waldorf something to do, rather than to lead anywhere. Come on, the Queen would be way better than this. You know she would. The episode ends with Dan and Blair going to another movie, while Serena heads to visit Ben in jail only to discover he’s been set free by the same judge. It's a little confusing. Did Lily end up springing him after all by getting the judge to grant parole? Hard to tell, but Ben happened to be lurking outside the jail at least, so that was convenient for S.
Where do you think things are going for Dair? Will Serena and Ben forge a relationship? Will Chuck's plan to use Raina help him win back the company at last? Do you care? What did you think of last night's Gossip Girl? Discuss!